Fingerprints have been used as a tool for law enforcement since the days of ancient china, where handprints and footprints were lifted from crime scenes then matched against suspects in the hopes of discerning guilt. While these early methods of forensic analysis were a bit crude (though there is at least one historic report of the handprint method successfully catching a thief) their core idea, that fingerprints are unique and can be used to identify a person, were remarkably modern. 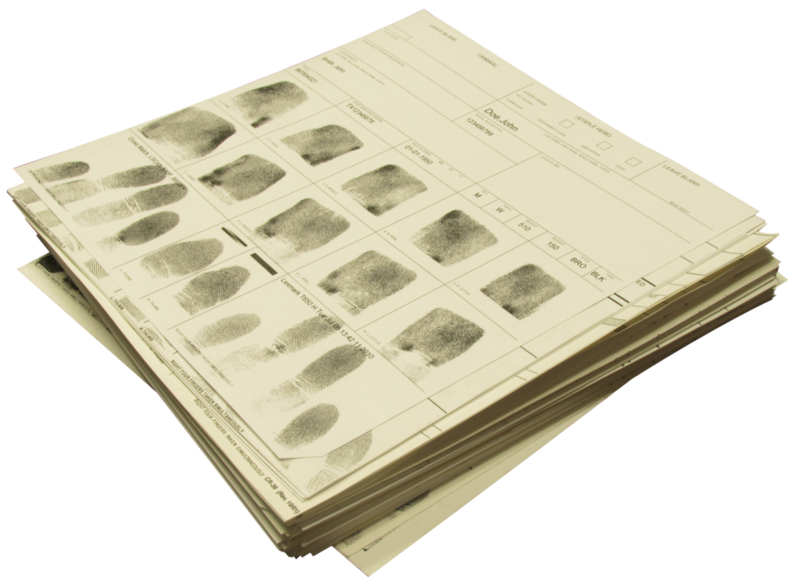 By the mid twentieth century, fingerprinting became a primary form of evidence in crimes ranging from forgery to murder, and fingerprint archives grew to include millions of prints from hundreds of agencies. Much like the ancient Chinese, law enforcement relied on ink and paper (along with a complex filing system) to capture and store fingerprints for comparison. This idea revolutionized forensic science, now fingerprints taken from criminals could be compared against state and federal libraries by fingerprint experts. This, however, was a slow process. It could take days or even weeks to submit prints and receive a response from a governing body. In fact, it wasn’t uncommon for people arrested for petty crimes to be released after a day or two of holding, only for the agency to later receive word that the person was wanted on more serious charges in another jurisdiction. There was also the problem of storage. While the fingerprint cards were small individually, when each agency had anywhere from hundreds to thousands of cards, the stockpile could easily become unmanageable, or suffer losses due to poor organization and physical wear and tear. Enter the digital age. High speed communication, expansive digital storage, and rapidly advancing hardware development all revolutionized civilian industry, and it wasn’t long before law enforcement began to feel the effects of these new technologies. Searchable data banks, automated prison systems, and portable laptops transformed the landscape of criminal justice. Fingerprinting, the historic heart of investigation, was no exception. The purpose of paper and ink prints is to create an image, a flat and identifiable representation which could be stored and compared with other similarly obtained images. However, with newly available scanning technology, it became possible to save fingerprints as digital images, erasing the need to physically roll and mail fingerprint cards. 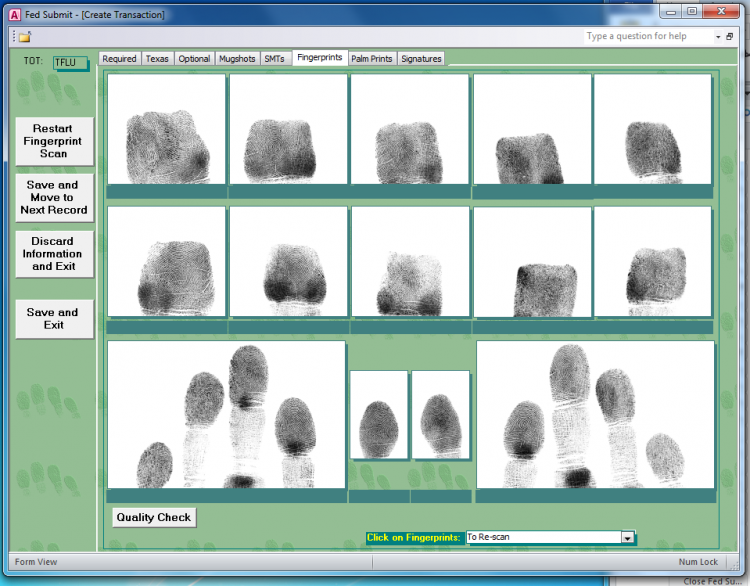 Fingerprint scanners, called “live scanners” work much like digital cameras, using very bright light or specialized sensors to take a highly detailed snapshot of the unique descriptive pattern detail of fingertips and palms. This snapshot is then converted into code, which can then be checked against a database of similarly coded fingerprints. This process of converting fingerprints into searchable code happens almost instantly, without the use of ink or paper, allowing quicker, more cost-effective processing. But where live scan systems really shine is their incredibly rapid response time and overall simplification of the fingerprinting process. In the past, rolling fingerprints required highly specific training and expertise, and it was impossible to determine a rolled print’s quality until the card had already been sent to a governing body for processing, at which point it may be too late to re-roll and re-submit the prints. With live scanning, quality can be digitally assessed prior to submission, and the intuitive scanners and software are far more forgiving to inexperienced print takers. Recapturing fingerprints in the instance of an incomplete or low-quality print is simple, with no mess, no unnecessary rerolling of other fingers, and no waste of resources. Unlike previous paper and ink methods that involved a long and arduous rolling and mailing process, live scans could very efficiently capture prints, send those prints along to local and federal databases, and receive a response, all in minutes. Suddenly you could know in less than an hour if the person being booked was who they claimed to be, and if they had any active warrants or prior arrests. All of this without waiting days or even weeks for local DPS to sort through their physical mail and match the prints by hand. Unlike social security numbers or driver’s licenses, which can be forged or stolen with relative ease, fingerprints are impossible to fake, and with such rapid and readily available results, they’ve secured a prominent position in the field of biometric and criminal identification. With live scanning it’s possible to verify individual criminal history, ensure proper inmate release (preventing mix-ups that continue to pose a serious problem), and build a permanent portrait of offense, all from one convenient system. 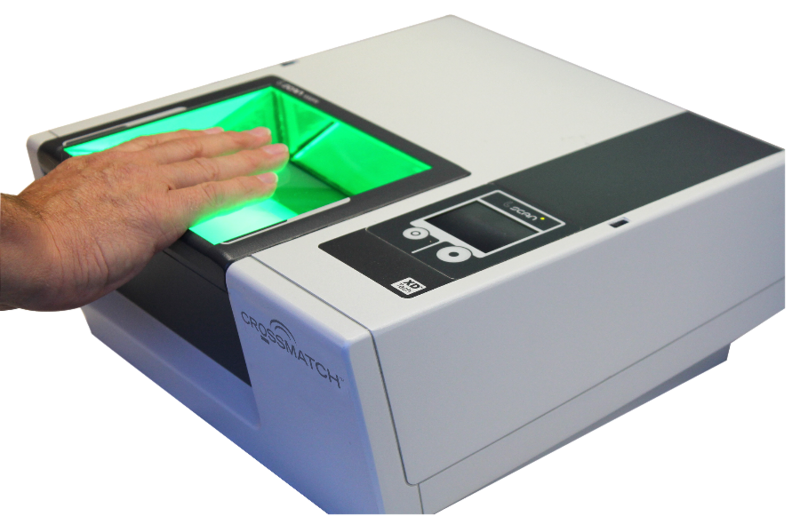 Complementary scanning technology, which utilizes high quality, FBI certified, fingerprint capture technology, can also be used to convert old paper and ink fingerprint cards into high definition, easy to store, and easy to search digital files. Archives that once took up entire rooms can be condensed into a single hard drive. The biometrics industry continues to innovate and improve, and fingerprinting technology has expanded well beyond its original roots in law enforcement to appear in consumer electronics, hospitals, and schools. The practical applications are almost limitless, and promise to change the way we think about identification and security. It’s impossible to know what the future of biometrics will hold, but Mentalix will gladly blaze the trail toward it.